Click image to enlarge. 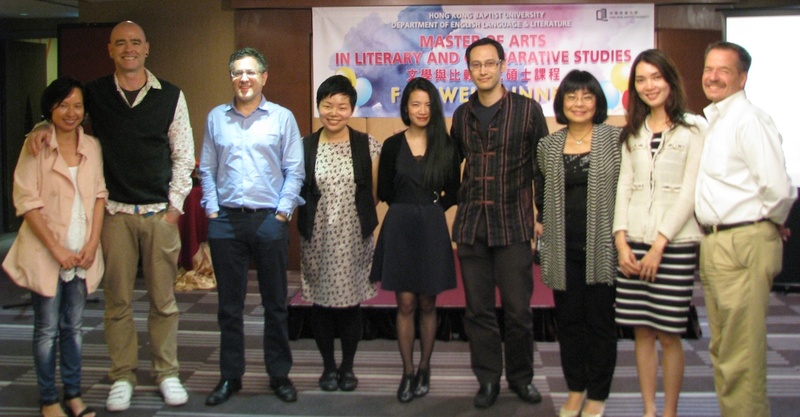 From left to right: Florence Leung, Jason S Polley, Douglas Berman, Heidi Huang, Tammy Ho Lai-Ming, Jason Lee, Julia Wang, Ruth Hung and Stuart Christie. This “Guess Who Quiz” is actually ‘stolen’ from our students’ inspired descriptions of each teacher during our farewell dinner held on 2 May. When perusing the joyful photographs of that unforgettable night, the idea struck me that I should describe my literature colleagues and myself in an interesting way. So I came up with a list of nicknames for each of us. Tammy and I had a good laugh over this list, and we decided that it would be challenging and fun to post it on Agora. See if you can guess who each person is! The winner will get a prize from us! The first two who can guess all the names will have lunch with Tammy and me! We shall make a table of four. James, will you reconsider No. 4 and No. 5? Maybe No. 4 is Dr. Heidi Huang, and No. 5 is Dr. Peter Jordan then? Bingo James! You got the names right at your second attempt!